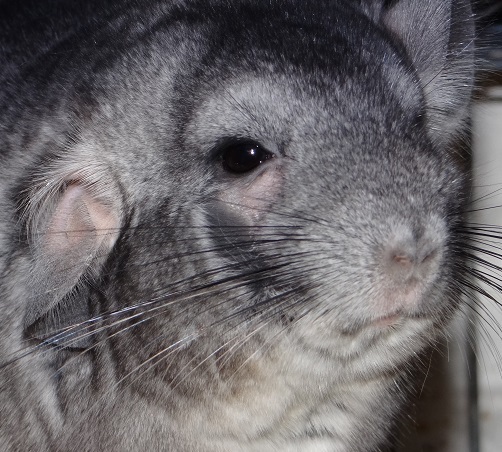 For the month of March, three (3) chinchillas were surrendered and eleven (11) chinchillas were adopted. Life is good. We’ve been doing a major overhaul of the primary and secondary rescue rooms at the Menagerie, but that is fodder for another post. We’ll have lots of before and after pictures to show later in the month. Right now, though, we need to talk about the importance of chew toys. Whimsy often says that chew toys are necessities, not luxury items. Because chinnie teeth grow constantly, we need to make sure that our house beavers have plenty of opportunity to wear down those choppers before they overgrow and develop into malocclusion. As mentioned before, hay is wonderful for the digestive system and for wearing down the cheek teeth. But even the incisors can grow into tusks if your chinnie doesn’t have nibbling and gnawing opportunities. Wooden ledges offer a safe chewing alternate to plastic shelves, but our real claim to fame is in our extensive assortment of chew toys. We’ve actually spent years trying to come up with perfect combinations of textures, flavors and densities. One thing we will not do, however, is adulterate a perfectly healthy chew toy with added flavorings or excessive dyes. While we do like the splash of color the wooden beads afford, soaking loofah and other natural items into unnatural shades is just not our thing. When we hear of people who put added flavor on their products it’s not difficult to imagine the same people putting soda pop in their infant’s bottle. This practice actually causes chins to expect stronger flavors and inhibits their natural need for bland, high fiber foods. Whimsy takes it as a challenge to come up with interesting chews to stimulate chinnie curiosity. Since a chinchilla explores their environment with their teeth, we want to encourage that destruction in a healthy way. Some people go halfway on the idea of chew toys: they want a toy that will last a long time. In actuality, the best chew toys are those that are most salient. In other words, the toys that your chin demolishes the fastest are the best ones. This means your chinnie is actively engaged in their toy and is getting the most benefit from it. Keep in mind that chinnie teeth go through growth spurts. There will be occasions when an ignored toy will suddenly get much more attention. This frequently happens with pumice toys. They sit in a cage for months and then…Bam! It’s as if the chinchilla suddenly discovers it, and all you find in the cage the next morning is a pile of rubble and dust. With that being said, our student helpers and we work diligently to keep a steady supply of assorted chews for your furbaby. Offering a few toys in a variety of textures is a wonderful way to meet their chewing needs. Plus, when you order our Whimsy Original chew toys you help sustain our rescue efforts and support the cognitive and motor skills of the special needs students who help assemble them.